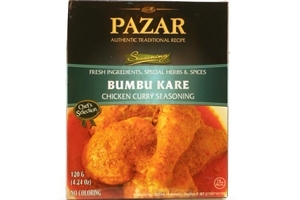 Pazar Chicken Curry Seasoning (Bumbu Kare) in 4.24oz (120g) pack. Pazar authentic traditional Indonesian recipe made with fresh ingredients, special herbs & spices. Product of Indonesia. Fresh Ingredients | No Coloring ۾∞ | Halal Certified حلال . Chicken curry is a common delicacy in South Asia, Southeast Asia, where it is usually referred to as curry chicken. A typical South Asian curry consists of chicken stewed in an onion and tomato-based sauce, flavored with ginger, garlic, chili peppers and a variety of spices, often including turmeric, cumin, coriander, cinnamon, cardamom and so on. Outside South Asia, chicken curry is often made with a pre-made spice mixture known as curry powder.